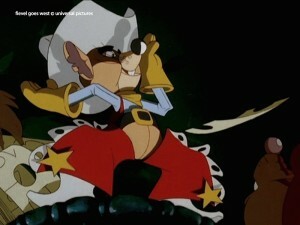 Fievel Goes West was a Steven Spielberg and Robert Watts´ production. From an original idea from David Kirschner, with Flint Dille and Charles Swenson´s screenplay, it was directed by Simon Wells and Phil Nibelink. Simon, at that time, was coming to the company as one of the main artists from Richard Williams´s studio, which just finished Who Framed Roger Rabbit?. Phil was an animator from Disney, with participations in almost every film of that studio generation, including The Great Mouse Detective, Oliver & Company, or The Black Cauldron. The art director was Neil Ross, already producing a lot of very impressive paintings that would attract me to visit his room, almost every day. 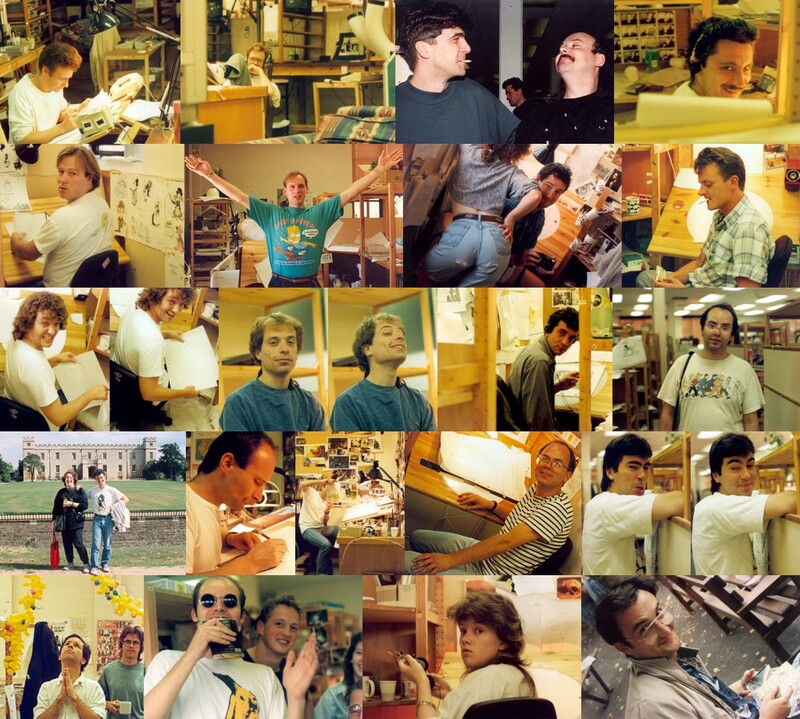 Among many others, the supervisors and main animators working around me were Uli Meyer, Kristof Serrand, Glen Sylvester, Thierry Schiel, Rob Stevenhagen, Roy Meurin, Shane Doyle, Greg Manwaring, Scott Santoro, Panagiotis Rappas, Calvin Leduc, Luc Chamberland, Peter Western, Bibo Bergeron, Raul Garcia and Nancy Beiman. To this post of my portfolio, because of Copyright, I´m only showing a few short giffs from the scenes I most like, between those I worked on with my crew. I had a big team of assistants, some of them, including Stephen Cavalier and Denise Dean, are still today good friends of mine. There was also Andrea Simonti, Rudi Bloss, Dave Webster, Ennio Torresan, Marco Trandafilov and Fabio Lignini. 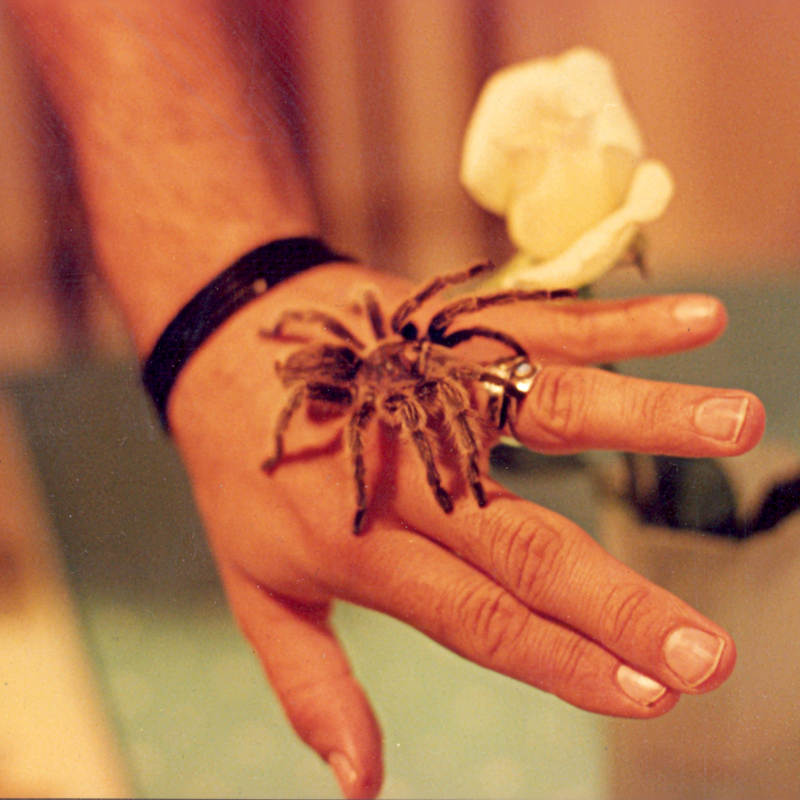 My Tarantula spider poses on my hand, in London, in the beginning of the nineties. I studied it to understand Arachnida species movements. I called the spider, Wayra, an Inca´s Wind God name, because originally this specimen came from Chile deserts, but bought in a British pet-shop. The Scorpion Sequence, when Fievel comes to have a surprising and quick fight with a Scorpion in a hole in the desert, became a big hit of mine, in the studio. I was at that time testing some “Arachnida” concepts on how to animate spiders and scorpions. I had even a real tarantula living in a cage, at my home, that I would occasionally bring with me to visit the crew. The impact of the finished animation on the pencil test was so good that both the directors and the producers requested to complete the color and backgrounds of the sequence as soon as possible. In the Cat Attack Sequence everybody in the studio did animate something, since the whole sequence was very complicated, full of mice and cats, jumping and running around. I had a lot of fun doing it, because I started to analyze live action shootings of crowd pattern movements, and realized pretty interesting things I wanted to work more on. So, when Simon Wells and the associate producer, Steve Hickner, came to give to me and my team, the Puppet Speech Sequence, I offered to them to animate the crowd in a more detailed way, giving personality to each individual in it, and with some random patterns I was studying then. They were a bit surprised, because that was not the usual reaction of animators, who hate crowd scenes. I remember Hickner replying: – Well, Spielberg loves crowd scenes! 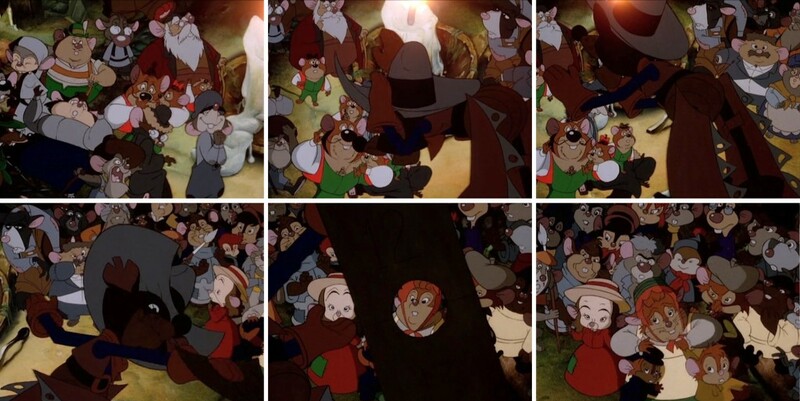 There were already many different mice to be used in crowds, but not enough for my sequence. So, we developed a new bunch of them, based in caricatures Ennio did from the artists around. To animate Fievel, in this sequence, I kept him in a very slow pace, in contrast with the weird Puppet and the restless crowd. The animation of the Puppet was my biggest challenge. In the beginning of the sequence the audience shall not realize he is a wooden toy, but only a slightly different mouse from the West. Slowly, its wires and its “puppetness” are revealed, as well as the Cat Raoul, hidden above and manipulating it. The cat´s voice is from former Python, John Cleese. And being myself a Monty Python admirer, that only added more joy at work in this sequence. 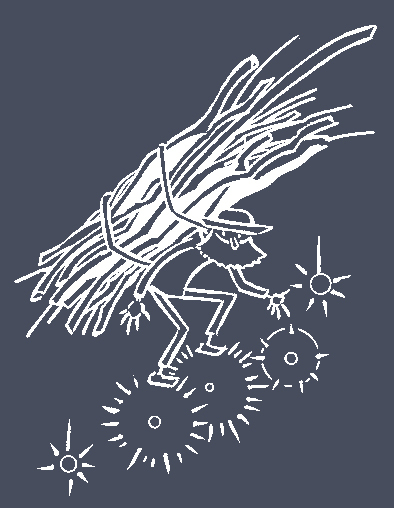 From Simon´s suggestion, I animated one of the Puppet movements as a Silly Walking Sketch. The whole sequence became very popular among the artists, pretty much because of all the caricatures, and even got a Nancy Beiman´s article, in a specialized magazine. Lovely to go in memory lane ,thanks to you. I remember very well your shots on Fievel.Great Work !! to you and your team you rock!! I hope you are well,all my best to you. My best regards to you too.